It’s hard to fathom spending December in a summer climate. Sun instead of snow. Bonfires rather than a yule log. Cold gin replacing whiskey’s warmth. Australia’s The Sunday Reeds can fill you in on the particulars with “Christmas in the Summertime.” Slathered with feedback from Drew Jones, Romana Ashton’s hazy vocals drip with sweat and ire. 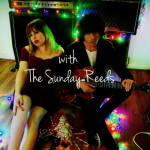 Download “Christmas in the Summertime” below and check out the video for “Pretty People,” the latest single from The Sunday Reeds here.